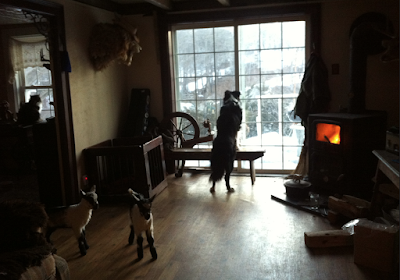 past springs had kids in the living room, but lambs will be here soon! Morning from a farm that feels a lot more like spring than it has in quite some time! The chicks in the brooder are getting feathery, the peas I planted are sprouting, and I have been spending more time outside walking...sometimes even in sunlight! You just don't realize how much you need time in the sun until you force yourself to meet him every day. After a winter of so much dark and cold and time indoors—to walk and actually feel sun-warmed skin and start to work up a sweat—to need to squint from the brightness of glare off snow... what a wonderful gift of realizing how much I missed all of that. I walked nine miles yesterday, my most yet. Since the truck has been in the shop for a few days (needed a whole new fuel pump and filter) I walked all the way to Shushan to visit Yushack's store and get some supplies. It sure changes your grocery shopping when you know you have to carry all your groceries four miles home. But I did bring back what I needed and then took the dogs for a walk up the mountain quick. I'm sort of a walkaholic now, if you can forgive that hacky phrase. Walking on trails and roads has been changing how my body deals with hunger, anxiety, and food. I move so much now I am basically a machine in motion, and food becomes more fuel than anything else. This is how I always dreamed of living. Like a thru-hiker on the Appalachian Trail - tired and always hungry and sleeping without stress. I've been slimming down and eating without any restrictions and I've not felt this good in a while. I'm sure a month without any alcohol is also a big part of that, but all of it is helping me feel better. Being sober, lots of water and exercise, and not counting calories or feeling guilty about eating half a small pizza after walking nine miles... and still losing lbs... I have to admit I'm a happier woman than I was mid winter. And stress is a lot less. Well, it would be a lie if I said I was without stress. I am still trying to stay ahead of any bank threats and keep the farm moving till I manage to land some sort of real luck - like a multi-article freelance contract, book deal, or family of 5 that wants private archery lessons for a whole weekend. But I will get there at some point. In the meantime I just racked up a $370 truck repair bill and that doesn't include the tow truck, but at least with all this walking I am too tired to not sleep through the night. In the meantime, this little farm is working on catching up on soap and illustration work, logos and freelance writing, selling CSA shares, pitching article ideas to editors, considering rabbits and bees again, planning the kaleyard and possible sweet corn on the hill and new pasture ideas... A lot. But I do well with a lot on my plate. I always have.